An easy recipe for crunchy granola loaded with chocolate chips. Adjust oven rack to upper-middle position and preheat oven to 325 degrees F. Line a rimmed baking sheet with parchment paper; set aside. In a large bowl, whisk together the maple syrup, brown sugar, vanilla extract and salt. Whisk in the vegetable oil to combine. 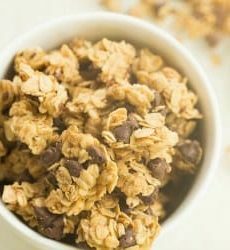 Add the oats and chocolate chips and fold the mixture together with a rubber spatula until all of the oats and chocolate chips are thoroughly coated. Turn the oat mixture onto the prepared baking sheet and spread into a thin, even layer. Using a stiff metal spatula, compress the oat mixture until very compact. Bake until the top is lightly browned, 40 to 45 minutes, rotating the sheet halfway through baking. Remove the granola from the oven and let cool on a wire rack to room temperature, about 1 hour. Break the cooled granola into pieces as large or as small as you like. The granola can be stored in an airtight container at room temperature for up to 2 weeks.